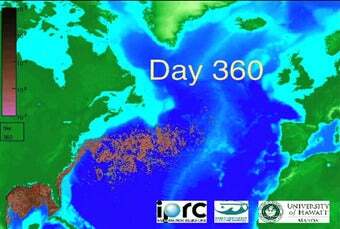 Researchers at the University of Hawaii at Mānoa have created a simulation of the potential spread of the Deepwater Horizon oil spill over 360 days. Their hypothetical scenario? All sorts of bad. Eight million buoyant particles were released continuously from April 20 to September 17, 2010, at the location of the Deepwater Horizon oil rig. The release occurred in ocean flow data from simulations conducted with the high-resolution Ocean General Circulation Model for the Earth Simulator (OFES). "The paths of the particles were calculated in 8 typical OFES years over 360 days from the beginning of the spill," says Fabian Schloesser, a PhD student from the Department of Oceanography in SOEST, who worked on these simulations with Axel Timmermann and Oliver Elison Timm from the International Pacific Research Center (IPRC), also in SOEST. "From these 8 typical years, 5 were selected to create an animation for which the calculated extent of the spill best matches current observational estimates." The dispersal of the particles does not capture such effects as oil coagulation, formation of tar balls, chemical and microbial degradation. Computed surface concentrations relative to the actual spill may therefore be overestimated. The animation, thus, is not a detailed, specific prediction, but rather a scenario that could help guide research and mitigation efforts. In the model, the oil begins in the Gulf of Mexico, weaves its way to the Gulf Stream, hits the Carolinas and Georgia around October 2010, and even delivers a diluted film to Europe's Atlantic coast. Timmermann notes, "After one year, about 20% of the particles initially released at the Deepwater Horizon location have been transported through the Straits of Florida and into the open Atlantic." Hooray — even though this is by no means a hard projection, it's certainly not heartening.